This project originally started with the idea of using pages from books on film. We drove to John’s favorite thrift store “The Jacksonville Humane Society Thrift Store” and began our search. We quickly realized that we weren’t going to find what we were looking for easily. 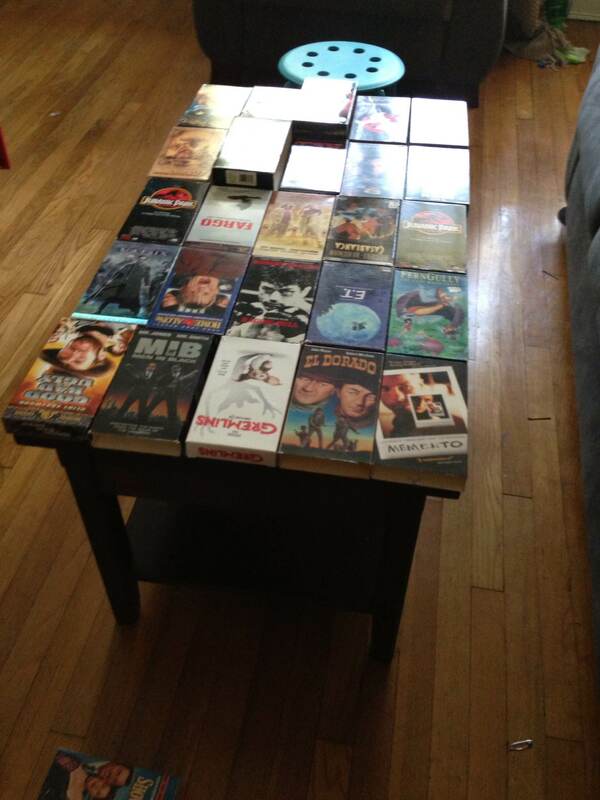 Then we got sidetracked as we often do by the collection of VHS tapes. We found some of our favorite when the idea hit me like a ton of bricks. VHS COVERS. YUP. The movie junkies in us were freaking out. 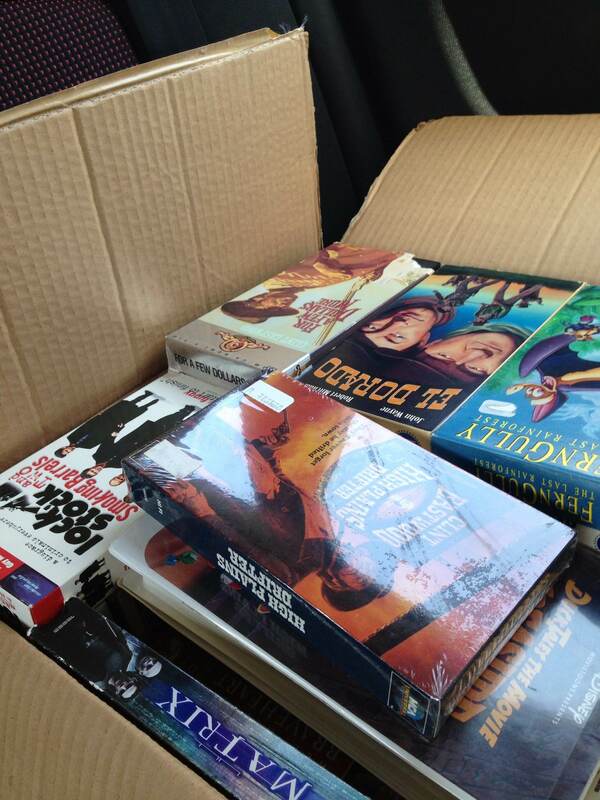 A whole box of VHS tapes! John used to frequent this thrift store during his propmaster days so the cashier gave him a great deal on them. SCORE! We swung by our local home depot to pick up some extra supplies and we were off! I think it’s best to start out by cleaning off your work surface. I just cleaned mine with a few Clorox wipes. 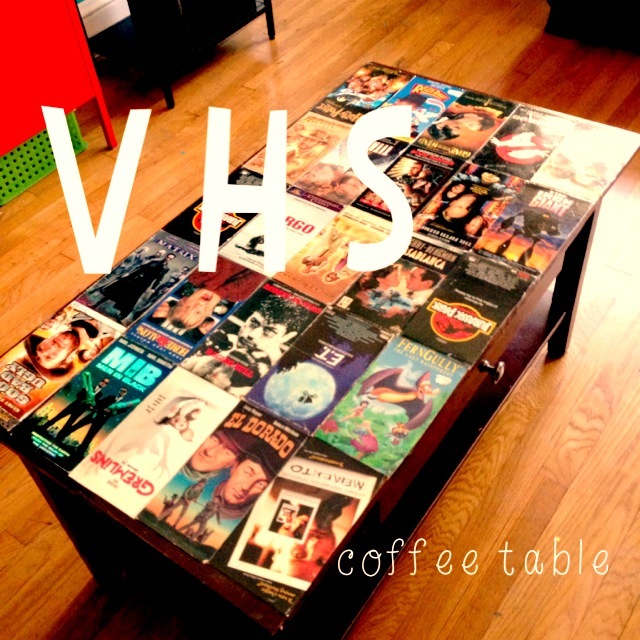 Lay out your VHS covers. You might find that you need to cut them down to fit more or you want them to turn them to make a pattern. This is the creative part. Go Crazy. For us this took a while. We wanted to feature as many of our faves as possible, but didn’t want to sacrifice the artwork. Disassemble the VHS box and cut out the desired image. We used only the front covers but we saved the side titles for a future project. 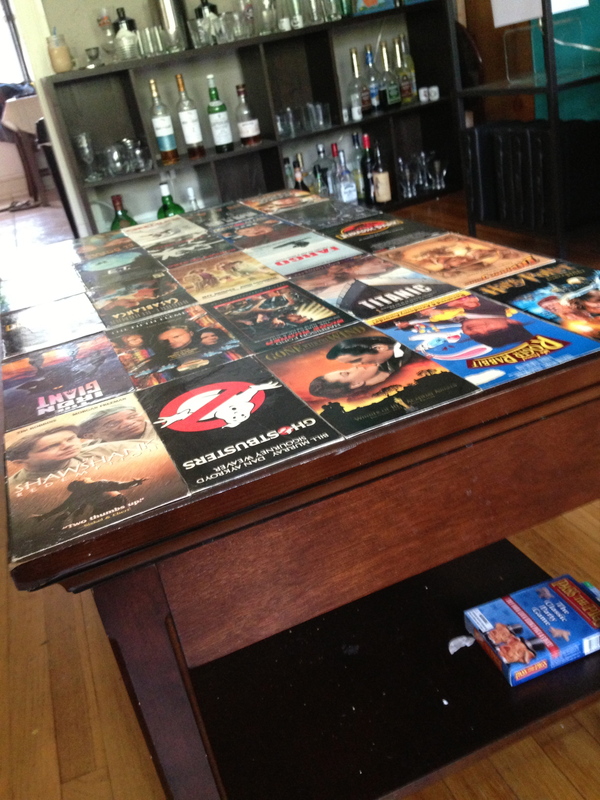 Place the vhs covers. Any way you’d like. Start Modge-Podging. 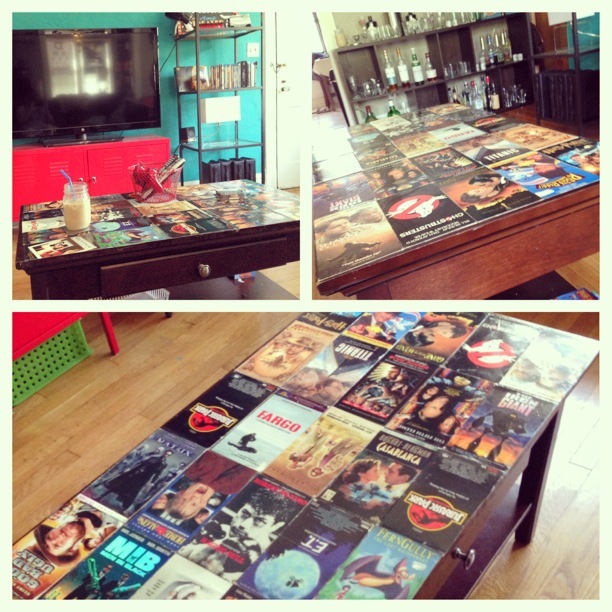 My method was modge podge the table, the back of the cover, and then over the top. I went through an entire jug of modge podge. No joke. Let it dry. This is where the patience comes in handy. Let dry for 4-5 hours. Add another coat of Polyurethane. Optional Add 1 more coat of Poly. Add coasters, remotes and baskets. I hope you enjoyed my first project post!